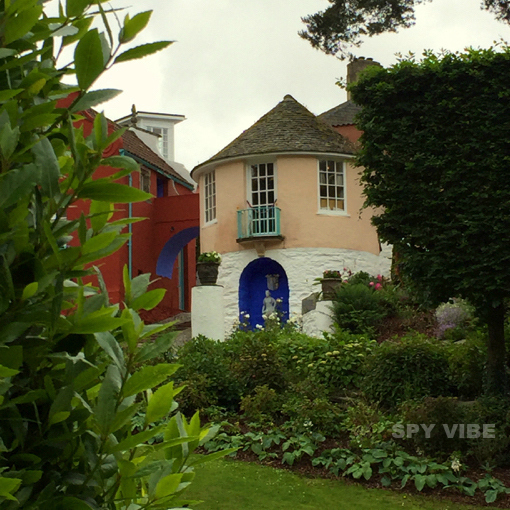 Interview: Rick Davy of The Unmutual visited the Spy Vibe lair recently to chat about his new publication The Prisoner: The Essential Guide, the 50th anniversary events, and about our love for Portmeirion (The Village in Wales where the series was filmed). Designer Alan Hayes of Hidden Tiger Books also joined our discussion. Welcome, Rick and Alan! Congrats on the new Prisoner Essential Guide! What does the book cover in terms of scope and content? Thanks! The book is sort of a ‘beginner’s guide’ to the series, so it tells the story of the conception of the series (with background on Patrick McGoohan and Portmeirion), through pre-production (with a look at the vehicles seen in the series, and Rover), location filming (with a look at the preparation of The Village and the role of the local extras), studio production (with a look at studio filming and other locations), and the legacy that the series have left behind, with a look at the various books and DVDs that the series has spawned. Also included is an episode guide (including synopsis, cast, crew and some interesting facts for each of the 17) and some previously unpublished, and officially licensed, photographs. Fantastic! It sounds like everything old and new fans will need to jump into the series and understand, as your title suggests, the essentials (and more!). The lovely design work was by our friend, author Alan Hayes of Hidden Tiger Books? What can readers expect to see visually in the Guide? Alan has done a fantastic job with the book, and I can’t sing his praises high enough. It is full colour throughout and I think the photos are really what sets this book apart from other small guide-sized books which have been printed about the series over the years. I am lucky enough to now own the original recce still photographs which producer Leslie Gilliat took in July 1966, a selection of ITC stills from studio filming, and also second unit cameraman Robert Monks’ private collection, and these can be seen throughout, along with some photographs kindly lent by extras who appeared in the series. I am also excited to have recently uncovered a previously unseen 8mm film of behind the scenes on ‘Arrival’ which was shot by a holidaymaker, so there are some stills from that film in the book too. That's so great you were able to include rare and unseen materials. You've had a long history with The Prisoner and Portmeirion. Tell us a bit about how you discovered the series and your early impressions. I was 10 when I first saw the series, in 1983/84 on Channel 4, and it immediately grabbed me as something different. At that point I was used to sci-fi and fantasy (with two older brothers into the genre it was always going to be so), stuff like Blake’s 7, Doctor Who, and Sapphire and Steel, but The Prisoner was unlike anything I’d previously seen, and unlike anything I have seen since. It had a profound effect on me as a youngster, and my fascination and love for the series has not waned in the 33 years since. I first visited Portmeirion in 1987 and I’ve been visiting many times a year, every year, since. Rather like The Prisoner, that place has a certain magic that is difficult to explain. I’ve found, when chatting to other people about both the series and Portmeirion, that one either ‘gets it’ or one doesn’t. I have a similar history of the show, love at first sight in 1977, but I've only just started my regular visits to The Village a couple of years ago. It is such a magical place. Did you become a collector of Prisoner-related memorabilia and artifacts? What are some of your favorite treasures? 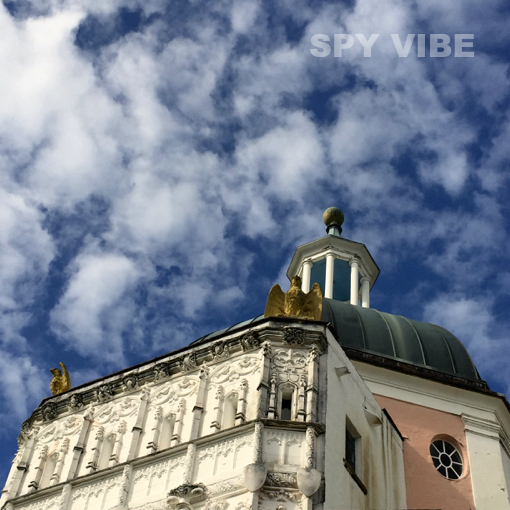 Above: Spy Vibe photograph from Portmeirion. I’ve never been a collector or completist, trying to get each and every badge or fan item that has ever been produced and so forth, but I do like to snap up rarer items when the chance comes up, for the sake of preserving them rather than see them lost in someone’s house for nobody else to enjoy. Especially one-offs, and I am very gratified to own the original master tapes of the first two blocks of soundtrack recordings, and one of only two original prints of the alternative version of the ‘Arrival’ episode, and a few rare stills (which I have included in ‘The Essential Guide’ and also provided to the company NETWORK to include in future editions of the series on DVD and Blu-ray). Unlike other series, which had many episodes produced by a TV company which continued for many years after, at studio buildings which still exist today, we only have 17 episodes filmed at a studio which was demolished shortly after. Rarities such as costumes and original documents are very hard to find because of that. Were you also a fan or collector of other spy shows and films? 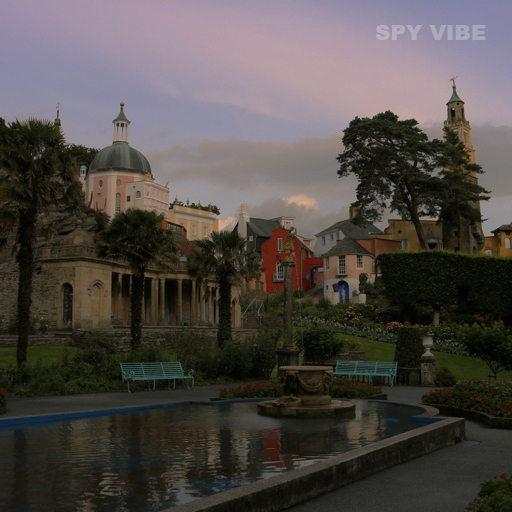 Above: Spy Vibe photograph from Portmeirion. No, only The Prisoner has really grabbed me in that way that I feel I want to preserve items. And thank goodness, I remember my annoyance at Prisoner original costumes being sold off by people who had no right to claim ownership of them in the first place, for the purposes of them being cut up for costume cards. If I invested money and time collecting for other series or films, I think I’d spend most of my time pulling my hair out at such sacrilege. There are other shows I will always love, such as Randall and Hopkirk (Deceased), The Persuaders, and Return of the Saint, and I have a few curios for each, along with curios for a few films, but they tend to be just books and so forth, nothing too exciting. Part of your role in preserving The Prisoner is The Unmutual. Please tell us about the organization and its various activities and projects. I’d like to think of it as a central hub for all Prisoner information, news, events, opinion, and research to be placed, so that everyone can enjoy it for free at any time. Since I took ownership of the site, I’ve also been keen to link up with Ty Gobaith Hospice for terminally ill children, so it’s great to be able to raise awareness and funds for such an important cause. As for any activities or organisation, it’s just a website, there is no group or society or anything like that, despite what some people might have you believe. It’s just a website run by one person, for ALL Prisoner fans to enjoy and contribute to; there’s no committee, group, or rules, and all are welcome. As long as it doesn’t impinge upon the rights of the series’ copyright holders ITV then I am happy to display, link to, or advertise any activity or event. So if any readers have not yet visited or contributed, please do so! The Guide is perfectly planned for the 50th anniversary celebrations. What is happening in the UK to mark the occasion? On 29th September 2017 the company NETWORK, who own the distribution rights to the series and are responsible for the fantastic DVD and Bluray (and soundtrack) releases of recent years, are holding a special anniversary event in the village. Details of exactly what will be occurring are still to be announced, but there will be screenings, special guests, activities, and it all coincides with a very exciting new 50th anniversary box set which will include a wealth of new content, including a new film. As always, keep an eye on The Unmutual Website for developments - as and when they are announced by NETWORK I will share the details and links that they provide. More books seem to be in the offing too, so do look out for those, 2017/2018 are going to be busy times for Prisoner fans. Such exciting news! I'm sure we're all eagerly awaiting details about the Portmeirion event and the upcoming releases! I wish I could be there with everyone, but it will be right as my students and I are starting a new school year. There was a US celebration planned in Seattle, but that has been canceled? 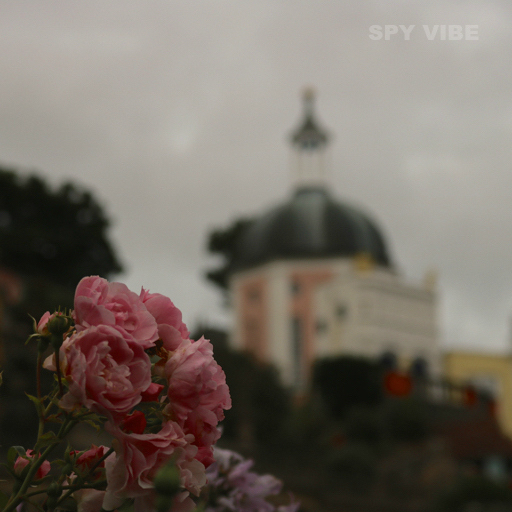 Above: Spy Vibe photograph from Portmeirion. Yes, that’s sadly correct. A great shame, as the organisers were very enthusiastic and had put together a great programme of attractions for attendees. Sadly, it seems as though the North American fans did not appreciate all the hard work, time, and money that had gone into it, and registrations were very low, well below the minimum number needed to host the event. Very sad. That is too bad. I wonder if fans were holding out to register late? Hopefully there can be another way for fans in the States to celebrate together sometime. What are some of your favorite stories about The Prisoner filming in Portmeirion? The Prisoner is undoubtedly a work of genius, and the crew must take a big part of the praise, as what they achieved at Portmeirion is astonishing, but I do love the little eccentricities which only come from having a knowledge of the filming, and having read interviews with the crew. Mickey O’Toole was a chargehand propsman for the shoot, and it’s fascinating to hear his tales of Rover being pulled along with a fishing wire, people hiding behind doors and pulling them open to make them appear automatic, and sellotaping safety pins on to the back of the villager badges. On screen, it all looks seemless and futuristic, but in reality it was, despite the care and expertise, a little haphazard at times – and this fascinates me, as it does not come across on screen like that at all. The crew were often asked to get involved with things which were clearly not their ‘brief’, and I think my favourite three are 3rd assistant director Seamus Byrne ending up playing the part of Rover’s first victim, crew member Roy Cannon asked to keep still as the dead body in freezing cold water in ‘Dance of the Dead’, and 2nd assistant director John O’Connor popping up in every episode in some sort of role- the amount of scenes in which he pops up in those early location-heavy episodes is astonishing! Every time I visit Portmeirion I feel strangely at home and I always discover new things. So many hidden treasures for the active observer and a playground for the imagination. It's no wonder Brian Epstein, George Martin, George Harrison, and Jools Holland enjoyed staying there. What do you find fascinating about the place? 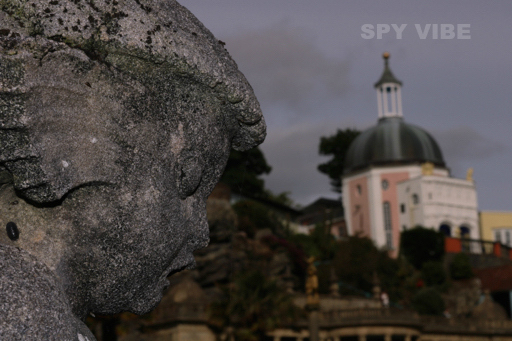 Above: Spy Vibe photograph from Portmeirion. As I said earlier, I think, like the series, it just has a certain magic. My favourite time of day is twilight, one can sit at almost any village vista and forget, for a moment, where one is. Not many places have the ability to do that. It has a certain ambience that I have never felt anywhere else. Rather like The Prisoner, I am also fascinated by the history of the place, and if I ever had a time machine I’d love to visit the village in times gone past. Nowadays, people on the internet are quick to criticise any changes that happen at the place, but people are too quick to forget that the village was constantly evolving. Take the piazza for example, such an important part of the village, and of The Prisoner, yet at the start of 1966, the year the series’ filming began, the piazza was a tennis court. Oh how social media would have been outraged when they placed a pond on top of the court! That's a good point! I think that very evolution adds a bit of mystery or puzzle-work when one visits, which is fun! When I first went there, I enjoyed trying to figure out how the area around the hotel, pool, and the helipad in the series might have been altered over time. As much as I love The Avengers, Gerry Anderson, and Bond, I would say The Prisoner is the one series that seems forever relevant in conversations about society, liberty, consumerism, and individuality. What are the elements in the show that make it timeless for you? I think you’re spot on with your question. The series is unlike any other, as it can be watched on more than one level. On one hand, if one chooses to (or doesn’t have the capacity to think beyond) it can be watched as a fairly ordinary ‘how will he escape?’ spy thriller. But what makes it special, is that there is an allegorical conundrum waiting should we choose to delve a little deeper. The village is all around us, and if one watches The Prisoner in 1967, 1977, or 2017 one can learn so much about society, and about ourselves. No other television series before or since has managed to achieve that. Hear! Hear! Now seems like a perfect time to remind all those James Bond fans among Spy Vibers to make sure to check out The Prisoner. I've found that many in that particular fan group have yet to have seen an episode. Now let’s bring Alan Hayes (designer of The Prisoner: An Essential Guide) into the conversation. Alan, please tell us a bit about your design background, as well as Hidden Tiger Books. 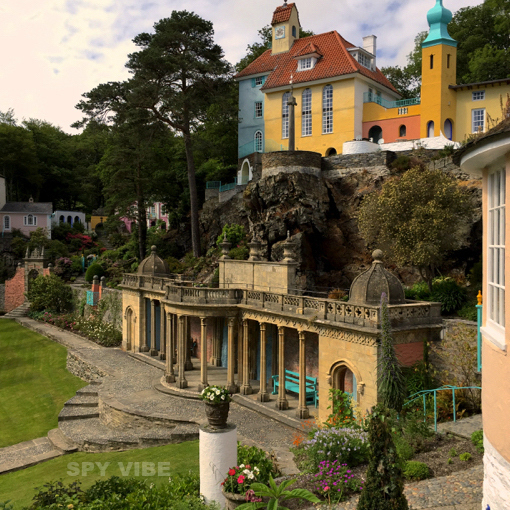 Below: Spy Vibe photograph from Portmeirion. I’ve been working in design, to some degree, since the 1980s, starting from humble beginnings designing my own Doctor Who fanzines. By the mid-80s I was working in education in a school’s design and print department, and have been print designer (and sometimes author) for Hidden Tiger since 2011 and print designer for theatre group Dyad Productions since 2016 working on their Edinburgh Fringe and touring productions including The Time Machine, which debuts this August. My work with Quoit Media has commenced this year, starting with print design for the Everyman audiobook and continuing with The Prisoner: The Essential Guide. How was your process designing the new Prisoner Guide? First and foremost, it was a labour of love for me. 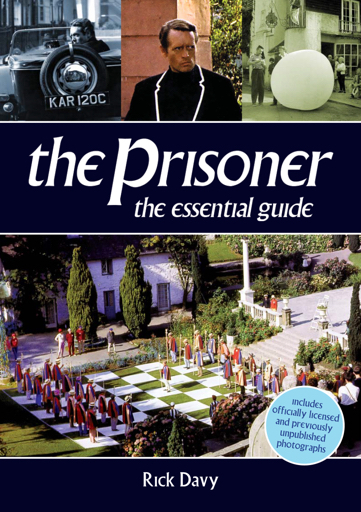 I adore The Prisoner and have worked with its author Rick Davy on prior projects (and as yet undisclosed ones! ), so I knew that this was something that would be a pleasure to do. Rick knows his stuff when it comes to The Prisoner, and just as importantly, he had a strong idea of what he wanted with the book and how he wanted it to look. It’s always easier working to a strong design brief, which is what I got from Rick. Of course, I brought my own ideas to the party and between us we settled on an overall look for the book, while coming up with some ideas to keep the book visually interesting throughout – and there are some nice surprises in there, some very rare photos, which I’d never seen before. What was the right Prisoner vibe for the look of the book? Did you narrow down iterations to arrive at the right balance of elements? Obviously, both Rick and I wanted the look of the book to be recognisably related to the series, and we hope that readers agree that we have achieved it. However, I like to keep layouts clean and uncluttered, so that the important elements are not overpowered by over design. As with any design project, this one went through a transformation from its start to its end, with several versions whizzing back and forth between my office and Quoit Media HQ. I am delighted with the final product, which makes full use the glossy colour printing throughout. And of course Rick’s text was every bit as excellent as I expected it to be, and that shouldn’t be played down. I can't wait to see the new Guide! Spy Vibers can order it here. 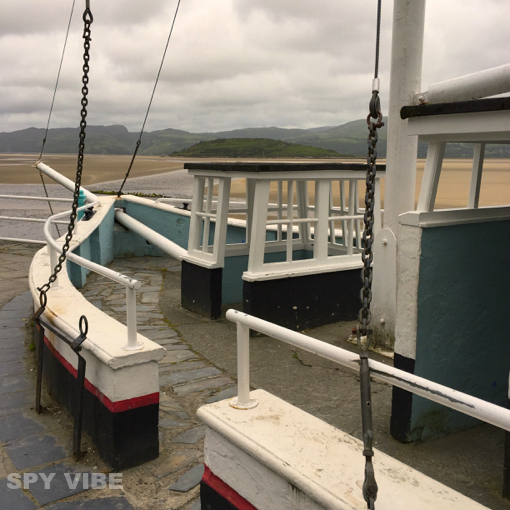 I want the rare images to be a surprise for readers and so have included my photographs of Portmeirion here to help spark those imaginations. Rick and Alan, thank you both for talking to us more about this cool project. As always, I look forward to seeing more of your work in the future and to seeing you both during our periodical film-location adventures. Related posts: Portmeirion Photography 1, Portmeirion Photography, The Prisoner London Flat, Interview: Police Surgeon, Alan Hayes Prisoner Audio Review, Interview: Ian Olgivy, Interview: Brian Gorman, Prisoner Supergrass, Prisoner XTC, Prisoner XTC 2, Prisoner DC Fontana, Interview: Avengers Two Against the Underworld, Umbrella Man: Patrick Macnee, Avengers Interview: Mike Richardson, Casino Royale Interview: Mike Richardson, The Saint Interview: Ian Dickerson, Avengers Interview: Rodney Marshall, Avengers Interview Rodney Marshall 2, John Buss Interview, Jaz Wiseman Interview, Farewell Steed, Maud Russell: Mottisfont Photography. Below: back cover of The Prisoner: The Essential Guide.